From left to right: Ahmed Mudassir Khan, Maroof Mian, Kaiser Tufail, Aamna Saleem, Roshaan Bukhari, Sameer R. Shami, Mian Mateen and Umair Asim. On the 30th of May, 2016, some members of Lahore Astronomical Society gathered at Zeds Astronomical Observatory for a visual and photographic session to observe the planet Mars through the array of telescopes, lined up at the observatory's roof top. This event was arranged because of the 1-in-a-decade event that was to go down! 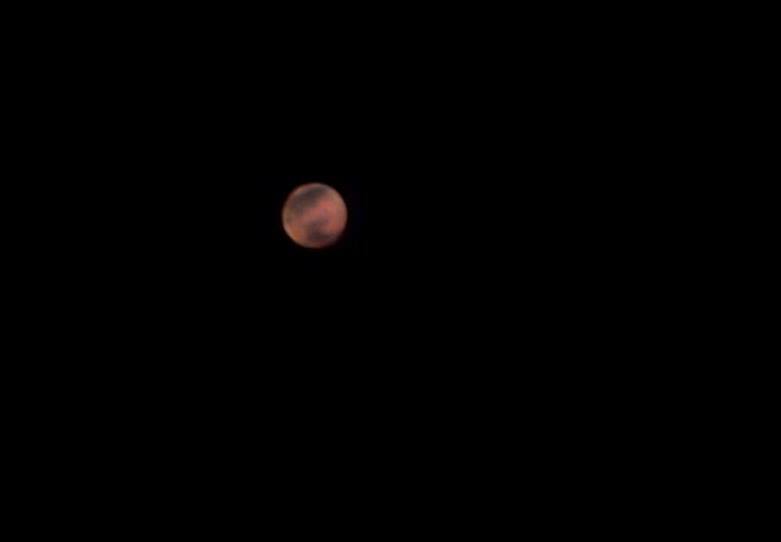 The planet Mars was closest to Earth (77 million kilometers) that night and appeared brightest in the sky. It was also the time when it would appear quite big (in 'Mars-through-a-telescope' terms!) through our telescopes. The sky was exceptionally clear and we just couldn't miss such an event! And we didn't! First one to show up was our Executive Member, Kaiser Tufail Sb. He brought his Celestron 6" SCT with him and set it up in a corner and began observation as soon as Mars was in sight! Meanwhile, there were 2 telescopes getting ready for Mars. First, Sameer Rashid Shami's Celestron 8SE SCT with SBIG ccd cameras, mounted inside the new observatory. Sameer spent a good couple of hours setting up the scope (focusing, attaching his DSLR instead of SBIG, refocusing and simply waiting for the temperature of his OTA to acclimatize with the outside atmosphere for minimal turbulence). Meanwhile, Umair Asim was busy setting up his Celestron C14 (the biggest telescope at the observatory). He had a long tube inserted in the OTA to help ventilate some of the outside air into the telescope, for rapid acclimatization. I, Roshaan Bukhari, joined the group of 3 and brought the observatory's 10" Dobsonian reflector that I had borrowed a few days earlier. I began setting it up as well. Tried to center it on Mars and Saturn to get a feel for the atmospheric conditions, which were pretty bad for Mars (since it was quite low on the horizon). We were later joined by Ahmed Mudassir Khan Sb with his 6" refractor and Celestron AVX mount. Unfortunately, his mount did not power up due to some technical fault in the power supply unit (which was fixed the next day!). Some moments later, Maroof Mian, Mian Mateen, Shoaib Usman Banday and Usman Maqsood Mirza joined in. Aamna Saleem joined us as well! Everyone busy with the equipment. Setting up for Mars. Mian Mateen is seen in the middle, trying his hand at afocal imaging of Mars with his mobile phone camera. Umair Asim soon announced that the Celestron C14 was available for visible eyepiece observation of Mars and Saturn! Visible observation from the giant telescope! Unbelievable is an understatement. I was fortunate to have seen Saturn with a 2.5x PowerMate and a 9mm eyepiece, along with Mian Mateen and Aamna Saleem. It was simply fantastic. The seeing conditions were such that the Cassini division would appear and disappear in a moment of milliseconds and one had to be patient if they wanted to see more details on the planet itself. The moments of clarity were astonishing. I and Mian Mateen tried our hand at afocal imaging of Saturn and Mars from the huge scope! The views, as magnified as they were, also magnified the atmospheric distortion. Our images looked promising but we knew we had to process them with a bit more technique and details would still be a little hard to bring out. We were, afterall, seeing the distant worlds at around 800x! We could easily see the rotation of Mars compared with our early observations (around 9pm) and our latest observations of the night (around 1 am). The planet and its surface features had indeed rotated out of and into view! Something so mundane and a 'back of the hand' fact suddenly appeared to be 10x more fascinating and amusing. There is indeed no alternative to a visual, eyepiece observation of the heavens! Nonetheless, all our efforts were fruitful when the results came in the next day. The Mars Mania 2016 was a success! Everyone enjoyed the views of the planet Mars. 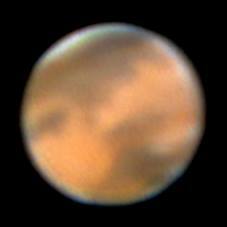 Here are some of the images of the red planet taken by members of Lahore Astronomical Society from their amateur equipment from before, during and after the Mars Mania event we had at the observatory.